If you see someone freezing on the street, your instinct is probably to call 911. But 911 wasn’t designed for emergencies of homelessness, and city leaders think it could be time to address that. Gillian Murphy was driving to work on a chilly day last winter when bright red underwear caught her eye: a man lying face down, head downhill, pants down, in a homeless camp near the Interstate 90 and Interstate 5 interchange. “I’ll never forget that image,” she said. She called 911. The dispatcher, Murphy said, was clearly very annoyed. Murphy didn’t have an address, and it was hard for her to tell what street the encampment was on. For emergencies: Call 911. If the person you’re calling for is under the influence of drugs or alcohol and wants to sleep it off, ask for the sober van. “Why do we keep getting these?” the dispatcher said, according to Murphy. 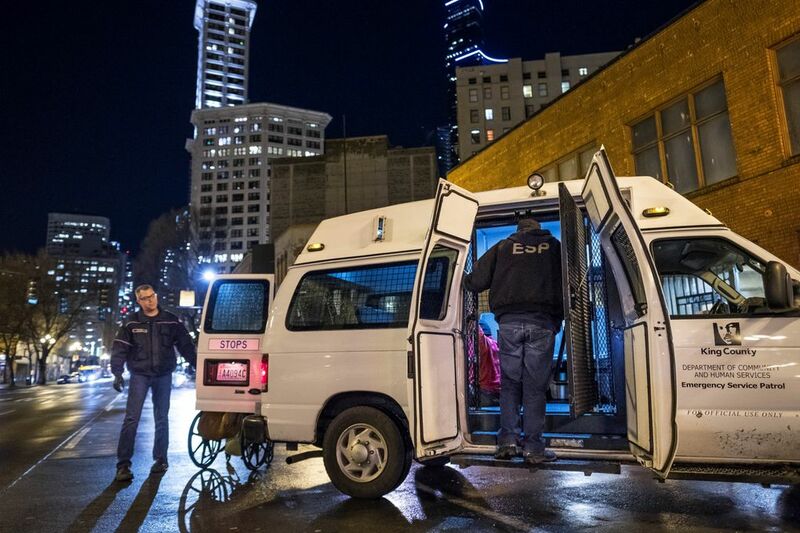 Even as the homeless crisis has reshaped politics of the city and region, 911 — the front door for emergency medical services — has not evolved to cope with the scale of the problem, city leaders say. That leaves callers like Murphy confused about where to turn when they see someone in need of help, especially if it involves a mental-health or substance-abuse crisis. The consequences of inaction can be bleak, especially in the winter. People without homes are eight times more likely to die of hypothermia than those with homes in King County, according to Dr. Richard Harruff, the medical examiner. Harruff identified 144 people who died in homelessness last year; one third of them died of an overdose of alcohol or drugs. That number is probably low. These are a small sliver of the homeless population — less than a quarter of homeless people in King County are chronically homeless, and 45 percent say they don’t use drugs or alcohol — but they’re also very vulnerable. Some cities have hotlines to keep people alive in extreme weather: Washington, D.C., which requires shelter for everyone when the temperature falls below 32 degrees, has a shelter hotline that dispatches vans to pick up people in danger. In King County, which spends nearly $200 million a year on homeless services, there’s something similar: Calling 211 in Washington connects callers to experts who can direct them to the myriad agencies that provide help. But that line is not for emergencies. Tristia Bauman, a senior attorney with the National Law Center on Homelessness and Poverty who monitors local policies, said she doesn’t know of a city with an adequate alternative to 911. Now, Seattle City Councilmember Sally Bagshaw is meeting with city and county agencies to patch homeless resources through to the 911 line. “The system has been built for police emergencies and fire and medical emergencies — but it’s evolved into so much more,” Scoggins said. The number of fire and medical responses in Seattle exploded in the past six years, from around 77,000 in 2011 to around 97,000 last year. And that’s just how many times crews were dispatched; for every response there are typically multiple phone calls. Here’s how it should work: A call to 911 goes to Seattle police. If the caller describes a person sprawled out in the street, the call typically is sent to the Fire Department, according to Kellie Randall, director of public affairs at the department. That van takes people to where they can sleep it off: The Dutch Shisler Sobering Center. There, if they want to stick around until the case manager comes in at 6 a.m., they can get set up with detox or counseling. But this service, too, is voluntary: They can simply walk out the door. Because the calls have to go through a few hoops before they get to the sober van, sometimes the van will show up and no one will be there. Sometimes they show up and the person who wanted to go to sobering has changed their mind. The sober van won’t take people against their will, so staff tries persistent persuasion, according to Dan Floyd, who oversees the sober-van staff. 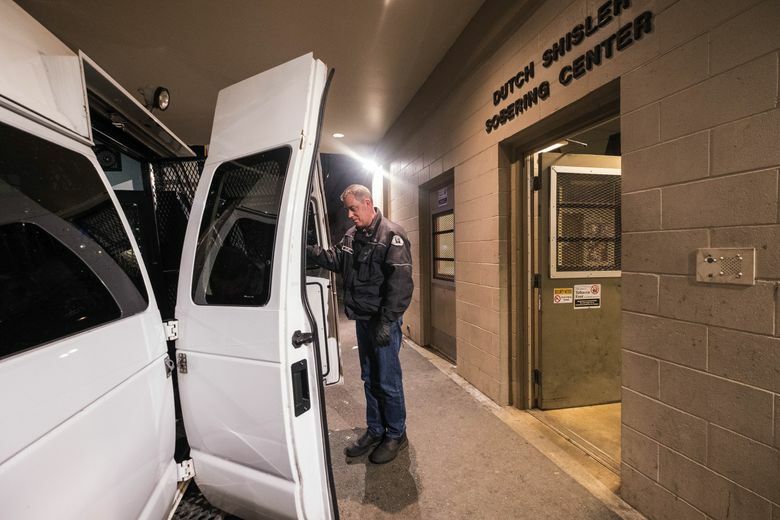 On a recent night of pickups, sober-van supervisor Rob Ewanio said he realizes the 911 system “seems counterproductive at times.” Some case managers ask Ewanio why they have to call 911 to get a sober van for their own clients. But King County hiring its own dispatch for the van would be a big undertaking: Ewanio guessed it could require three to six full-time staffers. The van program never knows how many 911 calls will be referred a night. 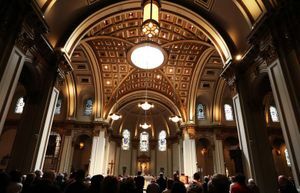 Bagshaw has seen this confusing process herself, and believes that this year — when the public and activists are highly engaged on homelessness — there is willpower at City Hall to change it. Bagshaw said she called 911 and asked for the sobering van to be dispatched. “Well, if he doesn’t want to go, they’re not going to send him,” the operator said, according to Bagshaw. This lines up with the Emergency Services Patrol’s policies. Bagshaw isn’t alone. When The Seattle Times recently asked readers for stories about getting urgent help for people in crisis, Seattleite John Maynard offered this one: He was driving on Western Avenue when he saw a woman “either dead or passed out,” lying on the sidewalk with no jacket. He pulled over and called 911. The dispatcher asked Maynard to see if she was alert; she wasn’t. A firetruck showed up in about five minutes, checked whether the woman was breathing, and left. 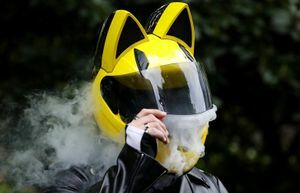 Maynard thought that was “a bit strange,” he said in an email. John Taubeneck was at the Third Avenue and Union Street post office a few years ago when he noticed someone passed out on the sidewalk and called 911. The operator asked if the person was sick or just drunk. “When I asked what difference that made, she told me that they wouldn’t send anybody if he was just drunk,” Taubeneck said in an email. This is the type of incident the sober van, which covers downtown Seattle, would respond to. These incidents spotlight the tension in responding to complicated behavioral-health crises and homelessness, and the need — according to Bagshaw and others — for a clearer set of guidelines. Bagshaw on the City Council, Scoggins at the Fire Department, and Vollendroff at the county are all talking with one another and with the constellation of agencies in the county about how to fix these issues. One answer could be hiring a 911 dispatcher with medical credentials who would be responsible for coordinating the sober vans and other services for homeless people in crisis. Another idea is to spread that knowledge across all 911 dispatchers. The Fire Department has experimented with one alternative: A nurse line that shelter workers can call for advice before calling 911. That line has only been tested at a few shelters, but Scoggins says it has reduced emergency responses to those shelters. The answer might be more of everything, said Jeff Lilley, president of Union Gospel Mission, whose “Search and Rescue” vans offer wool blankets, food, water and rides to shelter. “If you called 911 and they had plenty of beds and plenty of vans moving around, they’d say sure, call this number,” Lilley said. “But the beds aren’t there. 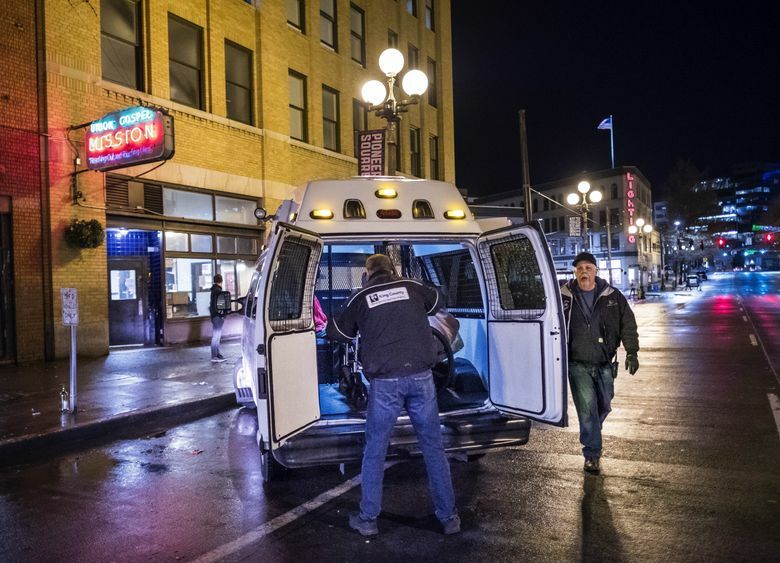 The vans aren’t there.” There are 49 detox beds currently available in King County. To illustrate what she’s considering to change the street response, Bagshaw drew a dozen circles, each representing agencies working on this problem alone. Bagshaw says that in a city like Seattle, where all these agencies exist to help, step one is to get everyone on the same page. A previous version of this story incorrectly stated the use of the King County Bed Bank Program. (800) 621-4636 only offers information on shelter availability at participating domestic violence shelters. Editor’s note: Due to the sensitivity of this topic, the comment thread on this story has been closed.